Billy Graham's casket was taken to the Billy Graham Training Center at The Cove on Thursday, Feb. 22. From there, it will be transported to the Billy Graham Library in Charlotte before being taken to Washington, D.C., and back to Charlotte, its final resting place. 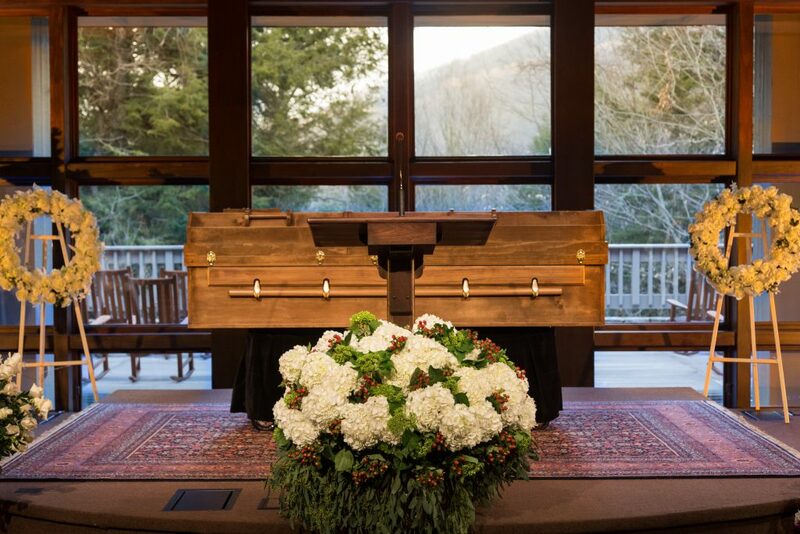 A simple casket for a simple man with a profoundly simple message of God’s love: That’s what visitors will see when they pay their respects to Billy Graham, the North Carolina-born evangelist who traveled the globe during his lifetime sharing the Gospel with some 215 million people. The pine plywood casket, crafted in 2006 by inmates at the Louisiana State Penitentiary in Angola, Louisiana, is lined with a mattress pad. On top rests a simple wooden cross the prisoners nailed into place. The plain wooden caskets caught Franklin Graham’s eye during a 2005 preaching engagement at Angola. That’s when he saw the inmates hard at work crafting them, and he soon learned why. The initiative began when then-warden Burl Cain discovered many of the poorer inmates were being buried in cardboard boxes. As a result, Cain had the inmates construct plywood caskets for themselves and others who couldn’t afford one. In addition to making the caskets, the prisoners—many of them former hardened criminals who are now committed Christians—also pray over them. Franklin Graham was struck by the simple and natural beauty of these caskets and requested the prisoners design and build two of them for his parents. Billy and Ruth Grahams’ caskets were built by inmate Richard “Grasshopper” Liggett, with the help of others. Their names are burned into the wood. “I liked the simple coffin with a cross on top,” Franklin Graham said in 2006. While the Grahams requested no special upgrades to the caskets, which cost around $200 to make, there were some slight modifications made to facilitate transportation to multiple locations. Mr. Graham’s casket will be transported from Asheville, North Carolina, to nearby Charlotte this Saturday. He will lie in repose at the Billy Graham Homeplace on the grounds of the Billy Graham Library on Monday and Tuesday, before going to lie in honor at the U.S. Capitol Rotunda in Washington, D.C., on Wednesday and Thursday, Feb. 28 and March 1. On Friday, March 2, a private funeral service will be held in Charlotte, where Mr. Graham will be buried beside his wife in the Prayer Garden of the Billy Graham Library. Ruth Bell Graham, who often visited prisoners and fed many in her home after their release, was buried in her Angola-crafted casket in 2007. In 2008, Franklin Graham visited Angola again, this time to dedicate a prisoner-built, privately funded chapel. Prison chaplain Jim Rentz shared the following memory during the service. >> Visit Billy Graham’s memorial website for continuous streaming coverage, updates on memorial events and to express your memories and condolences.